Changes at ITV mean it's not just the weather outside that's changing. Following an extension of the contract between ITV and the Met Office to provide weather updates on the channel, a new set of weather maps will sweep across ITV's regional and national forecasts during the course of Monday, with the new look making a debut during ITV's Good Morning Britain. Ahead of expected changes over at the BBC next year, when MeteoGroup take over the reigns at the BBC Weather Centre, ITV's new weather graphics will ditch traditional weather symbols with HD maps that the broadcaster says will help "give viewers a better understanding of how the weather will impact where they live, and how it changes over time." The new look is brought about in conjunction with the Met Office's new Visual Cortex graphic system, a system it says "enhances the weather forecasting experience for both presenter and audience." The new Met Office graphics have powered STV's forecasts since August. Meanwhile the winds of change have arrived at BFBS / Forces TV: a new contract between the British Forces Broadcasting Service and the Met Office has brought about the end of weather forecasts from the BBC Weather Centre ahead of the end of the Met Office/BBC Weather contract. 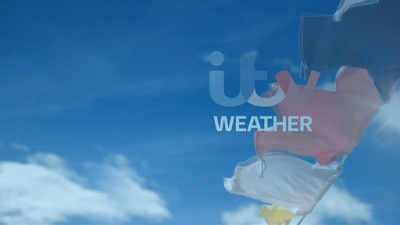 Since Saturday, a new weather service informing military personnel and families of the weather conditions around camps and bases around the world is now being carried on Forces TV, with the new service broadcasting directly from the Met Office operations centre in Exeter. "We're really proud to be continuing our partnership with British Forces TV. Our TV presenters are meteorologists and experts in their fields; many of them have worked in the military environment and know the location where the weather is being used, which means we can make our shows much more engaging for viewers." "We know the international weather forecast is important to service personnel and their families posted overseas and we are delighted they will continue to benefit from Met Office expertise." The Forces TV weather bulletin as part of the Forces TV News programme, every weekday at 1300, 1730 and 1900 and at weekends at 1500 and 1900. Forces TV is available on Sky 264, Virgin 244 & Freesat 652.